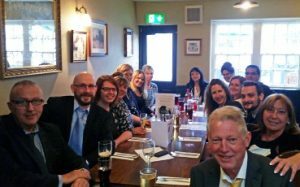 Anniversary Celebrations – 24 Years in Business! Formed in June 1992 by Managing Director Maria Mills-Farinas and business partner John Hepplewhite (sadly now deceased), Travel and Leisure Group is the longest-running timeshare broker in Europe. On 2nd June 2016 we celebrated our 24th anniversary… Along with the fact that during those 24 years, we have been able to succeed where many companies have failed. Many people ask why a timeshare broker would be called “Travel and Leisure Group”. In fact, this very question came up at our company’s celebratory lunch the day before. We sat down with our MD and asked her for the story behind the name, the company’s humble beginnings, and how it has gone from strength to strength. “My business partner John Hepplewhite and I worked in timeshare since its infancy in England around 1986,” said Maria Mills-Farinas. “On behalf of another timeshare management company, we ran Clovelly Golf and Country Club: a timeshare resort in North Devon. John looked after the golf, and I worked at bringing it from bankruptcy to an ongoing concern. “When the resort came to tender, only limited companies were able to bid. Because of this, we bought a company off the shelf which was then called Travel and Leisure Advisory Services Ltd. We had the intention to arrange travel as well as holiday accommodation—possibly not even timeshare! “Regrettably, a farmer who had recently settled in Clovelly outbid us,” she continued. “As we now had the company, the money, and the expertise in timeshare, we started the company that is now Travel and Leisure Group. We began with only four people, and have developed over the years to a team of over twenty staff. We offer international coverage to service timeshare owners worldwide. Furthermore, we now also concentrate on legal transfers of timeshare ownership, which has become an important part of our business. “Our slogan is ‘matching people with places with pleasure’,” said Mrs Mills-Farinas, “and on our 24th anniversary, we’re prouder than ever. Long may we continue doing so! Over the years we have earned a reputation of excellence, which has hugely contributed to our continuing success. Our team of staff has a combined industry experience of over 175 years, which means our clients know that they are in safe hands. Happy anniversary, Travel and Leisure Group! If you’re looking to buy timeshare, don’t hesitate in contacting Travel and Leisure Group timeshare brokers at your next convenience. You’ll receive first-class service from our friendly Buying team, who will be able to offer you weeks at over 50% off developers’ prices and give you comprehensive advice and recommendations from over two decades’ worth of experience in timeshare resale. Alternatively, if you’re looking to sell timeshare, contact our Sales team for a no-obligation discussion of your options. Registration on our database is free, and you’ve also got the opportunity to take up one of our fantastic advertising packages which include television and press coverage, including more specialised publications such as easyJet and Monarch in-flight magazines.